Book a ferry to the Yasawa islands easily by using the search box or browse our island hopping packages for accommodation, meals and activities included in your trip! The Yasawa Islands remote, rugged islands with white beaches, swaying palms and turquoise blue water. They consist of about 20 volcanic islands that are spread out over an area of 135 square kilometers, there are six main islands and several small ones. The extensive group of mountainous islands, some with peaks reaching as high as 600 metres above sea level, stretch in a north-east direction for about 80 kilometers. Before 1950 tourists were not allowed to set foot on the islands, with land based tourism only starting in 1987. The islands are now a popular, but certainly not crowded, destination for travelers seeking a true tropical island paradise escape. The accommodation on the islands are often run and staffed by locals which makes it easy to learn more about the Fijian culture. They usually provide evening entertainment through traditional dance, storytelling, and native songs. Traveling through the Yasawa Islands can be done aboard the Yasawa flyer or you can book a day cruise, boat charter (leisure and fishing) or a jet skiing trip. There are loads of other activities within the Yasawa Islands which you can find on our activity page that you can book together with your boat tickets. For more information about the Yasawa Islands on things to do, places to see, where to eat & drink and its nightlife you can check out our travel guide. Spend a week in the stunning Yasawa Islands, renowned for their pristine tropical waters, unspoiled beaches and rugged, remote landscapes. The coconut cruiser package allows you to experience four of the best islands in this popular Fiji backpacking region, with the option of all meals and various activities included. Travel aboard the Yasawa Flyer, island hopping in paradise for the holiday of a lifetime! Awesome Adventures offers transfers, packages, island hopping and day cruises throughout the Yasawa Islands and is the number one operator within this area. You can select or create a Fiji holiday Package including trips, activities, accommodation and tours in one go. Most activities such as snorkeling, kayaking, diving and summit walks, are offered through the resorts on the island. Select the length of your trip, your type of accommodation and the activities you would like to do and book your self-made Fijian trip or choose between 5, 6, 7, 9, 12 and 15-day tour packages, where you can visit several islands and do activities depending on which islands you visit. Within these packages you will be able to choose your type of accommodation and you can pick which extra activities you would like to do while visiting the different islands. Awesome Adventures offers an island-hopping ferry ticket called the Bula Pass which allows you to hop on and off different islands byreserving each step 24 hours in advance. This is a great flexible option so you don't have to plan your trip in detail ahead, you can decide where you'd like to go during your stay. The pass allows you to do one hop per day (keep in mind that most resorts have a minimum of 2-night stay) and the pass can easily be extended before the expiration date at the Travel Desk on the boat by paying the price difference. Departures are available to the following Yasawa Islands; Kuata Island, Wayalailai Island, Waya Island, Viwa Island, Naukacuvu Island, Nanuya Balavu Island, Drawaqa Island, Naviti Island, Yaqeta Island, Matacawalevu Island, Nanuya Lailai Island, Tavewa Island and Nacula Island. Within the Mamanuca islands the Ferry stops at south Sea Island, Bounty Island, Treasure Island, Beachcomber Island and Vomo Island. For more info on Awesome Adventures and the trips they offer on their Yasawa Flyer you can check out all the Awesome Adventures packages. The Yasawa group consist of 12 islands and offers a wide range dive opportunities. Divers can expect to see eagle rays, sea turtles and reef sharks, bump head parrot fishes, scorpion fish, sea stars, sea sponges, colorful hard and soft corals. The best season to see manta rays in Yasawa is between October and May when tropical water near Naviti island creates a perfect place for manta rays to find food. Read more about diving in Yasawa islands. 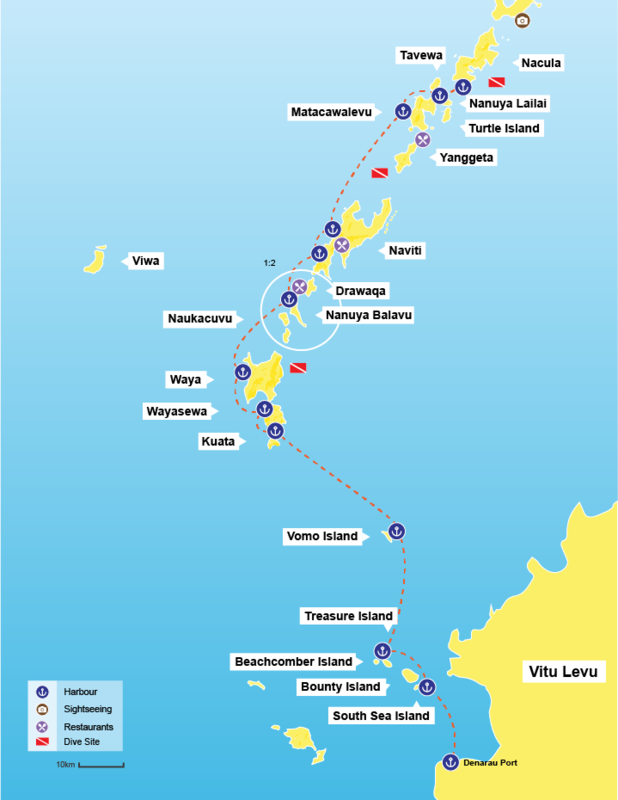 The most popular Yasawa diving spots are: house reef Kuata, Waya island, manta ray reef near Naviti island, Lekima’s Ledge, Bonsai, Maze, Zoo and Sea Fan city. Diving in Fiji is cheap. A first discover scuba dive will cost you around $100 Fijian dollars. An open-water dive license is around FJ$550 and includes four dives. Most one-tank dives in Fiji are around FJ$130. At Waya Lai Lai, if you dive more than twice the operator can sometimes drop the price down to FJ$55 Fijian dollars per dive. That’s about $30 USD for a dive! Book your diving trip in Fiji now! The ultimate day trip! Travel to Yasawa in style, arriving at Nanuya Lailai Island's pristine white sandy beaches and amazing crystal clear waters that boast some of the best snorkeling opportunities in the region. The memorable seaplane trip will depart directly from the airport in Nadi, taking approximately 30 minutes, during which you will enjoy magical views of all the islands in the Mamanuca Group. This day trip includes light refreshments and a double coursed lunch. As an optional extra, you may take a trip to the Sawa-I-Lau caves, which were made famous from the 90's 'Blue Lagoon' movie starring Brooke Shields.